This book is written for financial analysts who have a working knowledge of Excel and VBA and who wish to enhance their marketability by improving their modeling expertise. The goal of the book is to broaden the reader’s VBA skills and at the same time to progressively integrate Access, PowerPoint, and Outlook into an existing model. Significant attention is also directed to the design and execution of an Excel/VBA interface employing detailed UserForms. In addition, the construction of various reports, first in Excel, then Access, and finally PowerPoint is undertaken. Regardless of your area of financial expertise, this book serves as an essential guide to mastering leveraging the effects of Microsoft products in whatever applications you choose to build. The focus of the book is a case study containing a structured finance model. The case study model was originally designed for the securitization of a portfolio of commercial small business loans. This model now needs to be expanded to securitize a much larger portfolio of residential mortgages. The Original Structuring model will be bifurcated into a Sources of Funds model, the assets of the collateral pool, and a Uses of Funds model, the liabilities waterfall model. This will give the reader experience working with an existing model as a base departure point of development rather than the less common “start from scratch” approach. Once the Base Asset Model (BAM) and the Base Liabilities Models (BLM) are complete, each model will serve as the platform for future development. From the BAM and BLM a pair of much more robust models, the Collateral Cash Flow Generator (CCFG) and the Liabilities Waterfall Model (LWM), respectively, are created. The CCFG is designed to process a significantly greater quantity, variety, and complexity of collateral types. It also introduces the analyst to Geographic based prepayment methods as well as those using Financial/Demographic factor approaches. The LWM, operating independently of the CCFG, reads the collateral cash flow scenarios and applies them across a two tiered, six tranche bond structure. The liabilities waterfall contains provision for an interest rate swap, performance triggers and a variety of other credit enhancement features. With the CCFG and LWM now complete Access is introduced. Access will replace various Excel/VBA code modules in the CCFG such as the collateral data management, data scrubbing and reporting, data sufficiency testing, and eligibility screening. Access is also employed to export and the various collateral cash flows. In the LWM Access is used to import the cash flows, store the liability structure specifications, and export/save the resultant structure performance. PowerPoint is then introduced in the CCFG to allow for the fully automated production of presentation report packages. Last Outlook is added to the models to inform the analyst of model performance and to automatically distribute the various report packages to pre-designated mailing lists. The book contains over 750 exhibits of reports, menus, calculation, and algorithmic examples and most of all code. The complete Excel, VBA, Access, PowerPoint, and Outlook code for all of the models is included on the Web site. The Web site also includes Web chapters containing detailed instructions on how to create and populate a directory environment to store this code, run the models, and organize the results. Lastly there are other Web chapters containing supplemental information explaining the structure and function of the original model, bond and mortgage math (with calculation examples), representative line generator programs, and a tutorial on the construction and integration of UserForms. 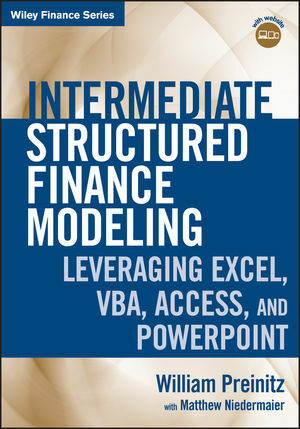 This book is the intermediate level companion volume to A Fast-Track to Structured Finance Modeling, Monitoring, and Valuation: Jump Start VBA; Preinitz; Wiley 2009, an introductory work on the subject. WILLIAM PREINITZ has thirty years' experience in investment banking and structured finance analytics. A former managing director at Citigroup, highlights of his career include the creation and marketing of securitizations backed by 12b-1 mutual fund fees. With a team of ten people over a fifteen-year period, his group concurrently provided analytical structuring support for the over 100 different asset classes contained in the ABCP program of the bank. These included such varied items as movie revenues, fast-food franchise financing, and communication satellite leasing. In conjunction with the bank's corporate training program, he taught Excel/VBA modeling classes to over 300 people ranging from associates to managing directors. MATTHEW NIEDERMAIER is currently a vice president in the Structured Finance Group at Markit, where he is a member of a pricing and valuation group focused on agency mortgages and CMOs. Within Markit he has also taught courses in Excel/VBA globally. Prior to Markit he modeled U.S. and Latin American ABS deals at Citigroup, including auto loans, credit cards,and timeshares.